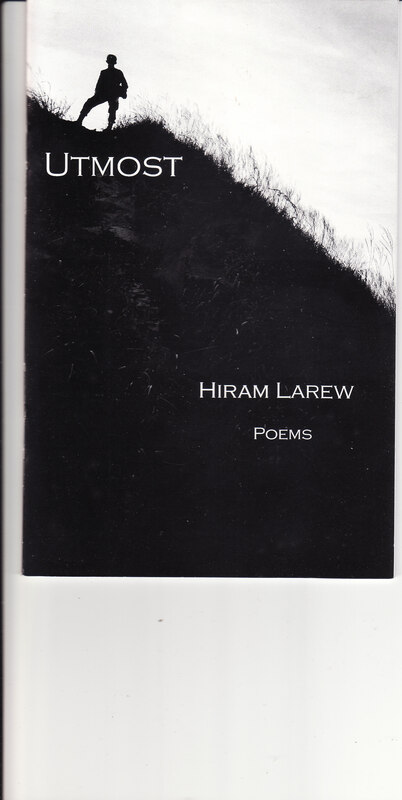 Hiram Larew is a very original poet. His style is as individual as the work of e. e. cummings or W. S. Merwin in the book Writings to an Unfinished Accompaniment. If Larew were a painter, his work would be akin to that of Paul Klee or Joan Mirò. His writing in Utmost is as challenging as any John Ashbery book, but Larew is not trying to evade meaning but express it. The poetry is primarily lyrical and thus contains those leaps of imagination which preclude rational explanations. However, there is a rational core that underlies the lyric. That I will try to discuss. I have been criticized by a “fan” as being too rapturous about the books that I have reviewed. During my reading and re-reading of Larew’s book I can’t help being carried away by enthusiasm. Loch Raven Review published this poet’s work a couple of years ago but I was unprepared for the mastery and singularity of expression. Larew doesn’t write family anecdotes or linear narratives or rework the fashions of neo-formalism. He is not heavy with Midas-like allusions that often turn the living language into a soft mush of academic currency. Except for that kind of poetry that tries to impress with faux-learned obscurity, more conventional approaches have praiseworthy characteristics. This original poet—I hope to show this shortly—dazzles with a vernacular imagistic dance of words. His lyrical work demands a sophisticated reader because of the unique style, but it isn’t clotted verbiage. Is there somewhere as far as you’re going? One of the secrets of Larew’s poetry is the suggestiveness of his phrasing. He employs the goal of the old cliché, “show, don’t tell.” Readers are implicitly asked throughout the book to supply their own interpretations of the words. Often phrases are incomplete. Cognitive meanings often are suggested but not definitively so. What do we ask last? Perhaps there are different responses to that question. This is poetry, not dogmatic religion. The poem isn’t telling us what to think. “Is there somewhere as far as you are going?” The question is nebulous. It is looking for an answer but, again, the readers have to answer it for themselves. And what life experiences do the readers bring to the text? The poet has his individual answer. They are hinted at over the course of the book but they are not hammered on a door like a nameplate. The seemingly vague phrasing is pulling answers out of the reader. This poetry is philosophic but not heavy about it, and look at the metaphors and images—“Like embers at night” (a simile). The abstract liquid of thought is expressed by the congealing of materialistic experience. “Like the embers at night” suggests a campfire or a hearth. The embers ground us and act as balance to the searching, the guessing about love, the nature of love. I think one of the beauties of this poet’s work is the vast scale of existence that he suggests. Again the reader fills in the blanks. Maybe all good poetry does this energizing but this is central to Larew’s method. How in good gray grace to round like trees? Let’s start with the title. One definition of the noun utmost is “the greatest or most extreme extent or amount.” To what is it referring? To the poet’s true existential self. He is looking for a kind of nirvana, an absorption into but also a consciousness of Existence itself. What could “I would be garlands older” mean? Perhaps as a poet this writer assumes the laurels of traditions past. Laurels? Is “garlands” a noun, a verb as a noun? Possibly. The contemporary poet is invoking the myriad historical experiences of the past. Perhaps he is also saying that he would be, in his ideal state of fully realizing himself, as wise as the wisdom of the past has taught the human race to be. “The same as damp steps”. What does that mean? Damp with rain? Rain is referred to in an earlier poem. Damp with tears? And what kind of steps are we speaking of or visualizing? The readers have to answer that for themselves. The words have an immediate impact as an image. It is pre-rational. The images work on that level. Is there something conceptual to discover? The next line “Or half-closed eyes” could suggest sight and insight both in the external and the internal world of the individual. The poet is turning away from the phenomena of the outer world but he is still very aware of it. In the next stanza there is the line “A bird straddling two branches”. Another expression of this? The last line in this first stanza is “Some barely murmurs after”. Suggestive of what? Monks? Maybe the murmurs could be interpreted as prayers but more likely they are the almost unheard thoughts of a contemporary poet after the sounds and events of literature and history. The individual lines and expressions are like flowers. They decorate yes but they carry the life of the poem and the poem of life. Hiram Larew’s work possesses a kaleidoscopic Ying Yang. He has much to say. Hiram Larew’s poetry has appeared in several journals and books, and his poems have received awards including a couple of Pushcart nominations and first prizes from Louisiana Literature and Baltimore’s Artscape festival. He has spent time at the Weymouth Center, Bread Loaf Writers Conference, Rope Walk, the Catskills Poetry Conference, and the Virginia Center for the Creative Arts, and has published two collections. He lives in Upper Marlboro, Maryland, and recently retired from directing international farming programs for the federal government. Dan Cuddy is an editor of Loch Raven Review. Previously he was a contributing editor with the Maryland Poetry Review and with Lite: Baltimore’s Literary Newspaper. He has been published in many small magazines over the years, such as NEBO, Antioch Review, Connecticut River Review. In 2003 his book of poems Handprint On The Window was published by Three Conditions Press.